Expand your studies with notebooking activities, experiment project pages, review questions; Scripture copywork; field trip sheets; and much more! 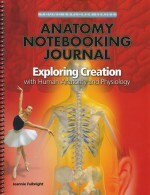 Accompanying Apologia's Exploring Creation with Human Anatomy & Physiology, students will take ownership of their learning as they fill it with notes and reminders of what they've learned through their careful study! Personal Person templates for your student to use when creating their paper model of a human body. Project Pages and Scientific Speculation Sheets for the student to keep a record of and log experiments or projects. More to Explore ideas for each lesson. A Final Review with fifty questions the students can answer either orally or in writing. 180 pages with 63 appendix pages; softcover, spiralbound.